The thirty-third Ivy League Model United Nations Conference, known as ILMUNC, took place in Philadelphia from Thursday January 26, to Sunday January 29. Hosted by Penn State in the downtown Philadelphia Marriott, over 3000 students from around the globe took part in 28 various committees. ILMUNC, the biggest high school Model United Nations conference in the Northern hemisphere, prides itself in its wide variety of committees. Delegates from BHSEC represented Afghanistan in the World Health Organization to the Disarmament and International Security Council and the 2022 Council for Environmental Development. There were also a couple of BHSEC students who did not represent Afghanistan, but rather other organizations and people such as the Jerusalem Post and members of the Chinese Communist Party. The conference took place over four days, including 18 hours of committee work shrouded by other events hosted by the ILMUNC staff. Tours of Penn State and morning ice skating were offered, as well as live music and a dance for the delegate’s entertainment at night. Despite all of the fun events offered, Model UN requires hours of writing and working with fellow delegates outside of the scheduled working hours. The experience is often a chaotic and exhausting experience, although in the end, win or lose, it is rewarding for those who participate and commit themselves to the actions. Nevertheless, there are many different awards given at the closing ceremony. Verbal awards are, as implied in the name, a spoken recognition of achievement given to a few delegates in each committees. Honorable mentions are of slightly higher prestige, where the winner receives a certificate of excellence. This too is given to a small number of members in each committee. Outstanding awards go to the delegate in second place, also receiving a certificate, and best delegate receives a gavel for coming in first place. Although BHSEC was not as successful as in previous years, several delegates did win awards. Verbal awards went to Stasya Rodionova and Gaia Moisan of the Social, Humanitarian, and Cultural Committee, as well as Chris Stauffer and Rainer Turim of the United Nations General Assembly 1946: The Inaugural Session of the United Nations. Maya Rubin and Kira Carleton of the Special Political Decolonization Committee won an honorable mention. Finally Max Shatan, representing Peng Dehuai of the Chinese Communist Party won an outstanding award. Winning an award of any kind is difficult and an honor, especially at a prestigious conference such as ILMUNC. 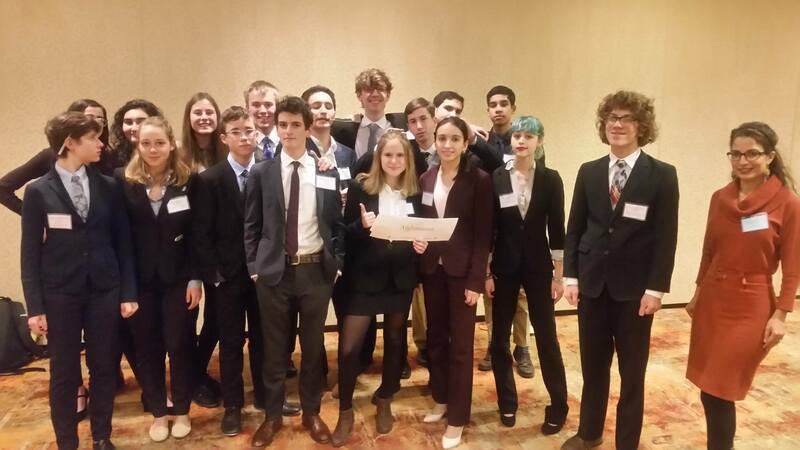 BHSEC Model UN returns to New York City this spring, and hopes to prevail over the upcoming smaller conferences. If you’re interested in joining the Model UN team, come to the weekly meetings in Room 309 on Wednesdays at 3:20pm. BHSEC Manhattan’s Model United Nations team at ILMUNC. Photo credit: Mr. Mikesh.